Remember that Rice krispies Treats commercial where the homemaker pretends to have been working so hard in the kitchen to make her special dessert? 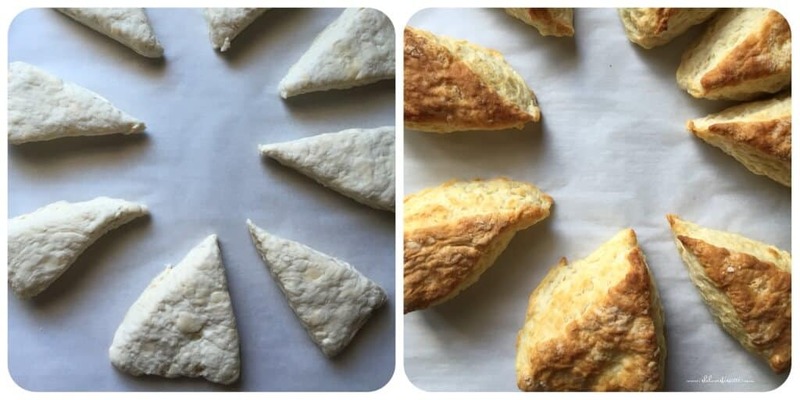 Well, that’s how easily you can make this recipe for buttermilk biscuits. Once you gather your dough, it’s just a matter of gently rolling it out and cutting it up. Traditionally, you can use a round biscuit cutter, but I find that re-rolling the “leftover” dough creates a tough biscuit. So, I cut them in wedges, just like I did for these Lemon Blueberry Cornmeal Scones. 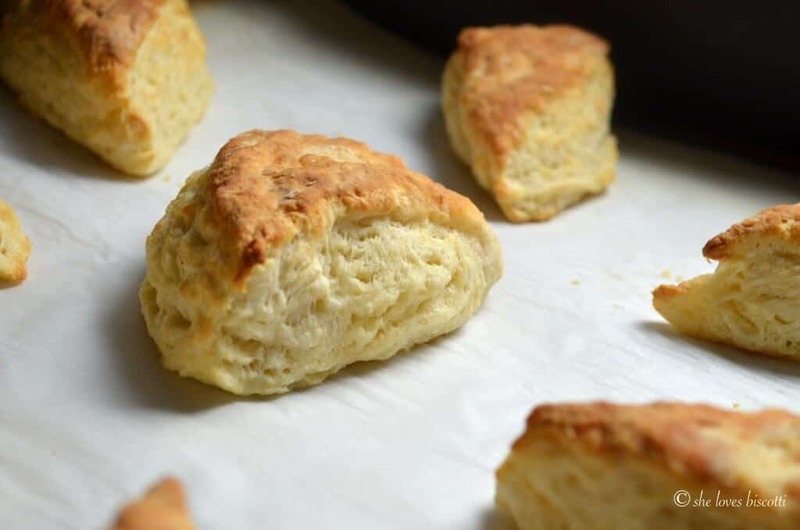 These buttermilk biscuits need to get baked in a really hot oven for just 15 minutes. I’ve adapted this recipe from Alton Brown. You can find the original recipe here. I am a HUGE fan of his and still enjoy his cooking show Good Eats. Thank-you Mr. Brown. I started freezing the butter after I saw an episode of Chef at Home (with Michael Smith) where he said that freezing the butter was a chef’s secret in obtaining a fluffy biscuit…he is absolutely right. Thank you Chef Michael ! This recipe is also very versatile. Add some chives and cheese and it becomes a savoury biscuit; and a few teaspoons of sugar and you have your biscuit for a strawberry shortcake. It’s wonderful to have with a teaspoon of homemade strawberry jam. These are also the perfect biscuits to have with this Healthy Chunky Vegetable Fish Chowder. 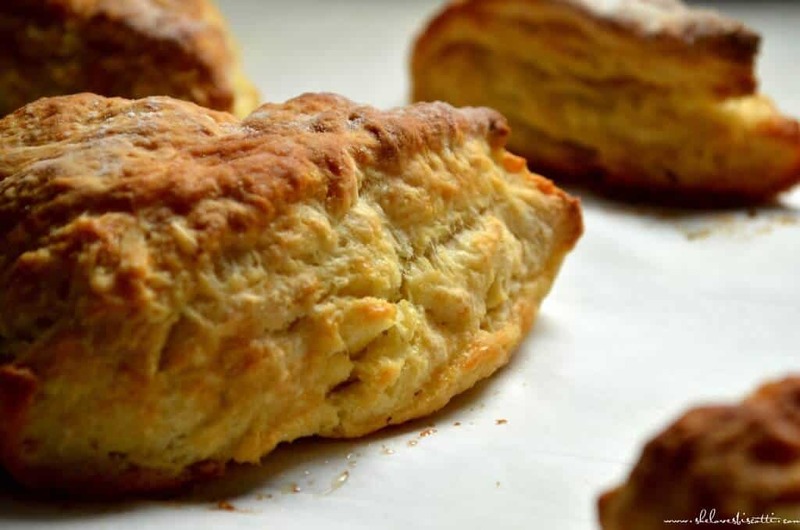 This recipe for buttermilk biscuits will not disappoint. Have fun with this and enjoy all the wonderful comments your loved ones will make. 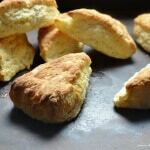 Easy to make buttermilk biscuits. They always turn out light and fluffy. Did you know that freezing the butter is a chef's secret ? Toss gently to incorporate the butter. Make a well and pour in the cold buttermilk. Stir until just combined (I use a wooden spoon). Knead gently 4-5 times and then pat into a 1-1 1/2" thick rectangle or round. Cut into rectangles or wedges (this avoids any left over scraps you would get by using a round cutter). Place close together on parchment paper. Bake until fluffy and golden brown, about 15-20 minutes. You can substitute buttermilk with sour milk.Measure 2 tablespoons of lemon juice and add milk to make 1 cup. My pleasure Val! I am always amazed at how light and airy these biscuits turn out. Thanks so much for stopping by, appreciate your comment. Made them today and they were very lovely and so fluffy. Thanks for the recipe, Maria.